So it probably shouldn't surprise us that this was the sort of series where, with the home team at bat in the third inning of the nationally televised rubber game against their most hated rival, many Yankees fans seemed more concerned with keeping the wave going than with what was happening on the field. This sort of thing's been happening a lot more since the new stadium opened, and apparently the presence of the Red Sox isn't enough to prevent it. This weekend, Boston was just another opponent that the Yankees needed to beat to stay ahead of the Rays and Orioles, who annoyingly won't go away. Sure, there were some extra boos when the Boston lineup was read, but the days when these teams would beat each other up 25 times a year are gone now, at least for the time being. There's nothing wrong with this; like we said, it's inevitable. And it'll return, eventually. But last night, we got the wave in the third inning. It was weird, and kind of sad. 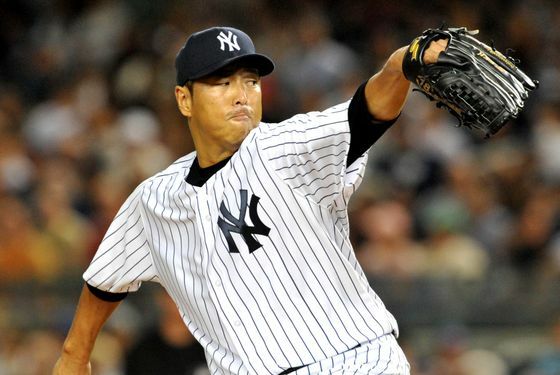 Anyway, the Yankees won the game, and while there are nights when one can look at the Yankees' starting lineup and wonder how they're winning so often, it's easy to like their chances when Hiroki Kuroda is pitching. Last night, he threw eight great innings of one-run ball, and got help from Ichiro Suzuki (who homered twice) and Derek Jeter (who had three hits, including two doubles). The Rays and Orioles also won yesterday, though, and so the Yankees remain five games ahead of Tampa Bay and six ahead of Baltimore. The Red Sox may have a couple of breaths left, at least in the Wild Card race, but the Yankees have other A.L. East teams to worry about right now. The Yankees now move on to Chicago to play the White Sox; Freddy Garcia pitches in the series opener tonight.